Washington, DC - Bao Bao was born on August 23, 2013, at the National Zoo. Giant pandas are an endangered species, and are protected in part by conservation efforts at reservations and in zoos such as the Smithsonian National Zoo in Washington D.C. Giant Panda births are rare. She is has reach a major milestone at the National Zoo and will soon begin living separately from her mother. 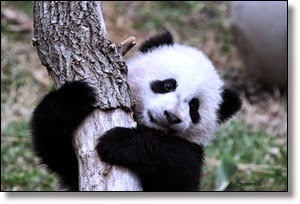 18 months old, is the age when panda cubs stop nursing and start living separately from their mothers. The zoo says Bao Bao began the weaning process naturally a few months ago. She is now eating significantly more bamboo and other solid foods. Bao Bao eats separately from her mother and spends about six hours each day separated from her mother. The zoo's panda team expects the weaning process will be complete in early March, and Bao Bao will be living on her own. Zoo veterinarians also say panda mother Mei Xiang is in good health. Baby panda Bao Bao has had her public debut at Washington, D.C.'s National Zoo, with hundreds lining up for a glimpse of the five-month-old. WSJ's Neil Hickey reports on how Bao Bao is coping with the public adulation. In the first episode of our web series, Wild Inside the National Zoo, we track a year in the life of the zoo's biggest star. Jan. 6, 2015—As the year’s first blanket of snow coated the Washington, D.C. area today, giant panda Bao Bao spent much of the morning playing in it for the very first time. The sixteen month-old panda cub tumbled down the hill in her outdoor enclosure, climbed trees and pounced on her mother Mei Xiang.